I like fried eggs. Nothing startling you say. For me though, it is. Our household are big consumers of the little oval delights – we go through about 30 every two weeks – but always in scrambled or poached form. I’ve even been known to tutt-tutt those around me who go fried as I polish my halo and fill a pot with water for the poaching ritual. Up until a week or two back, I couldn’t tell you the last time I had a fried egg. Probably when I was under 10 – so a few years ago. I certainly have never made one for myself before. So it was with surprise and absolute delight that I discovered how delicious they are, after nibbling on the one I made Master two-and-a-half. Egg sorted, you need something to put it on. Of course that’s going to bread. And, as you’ve come to expect of me, my new best buddy Kenny has come in handy again. 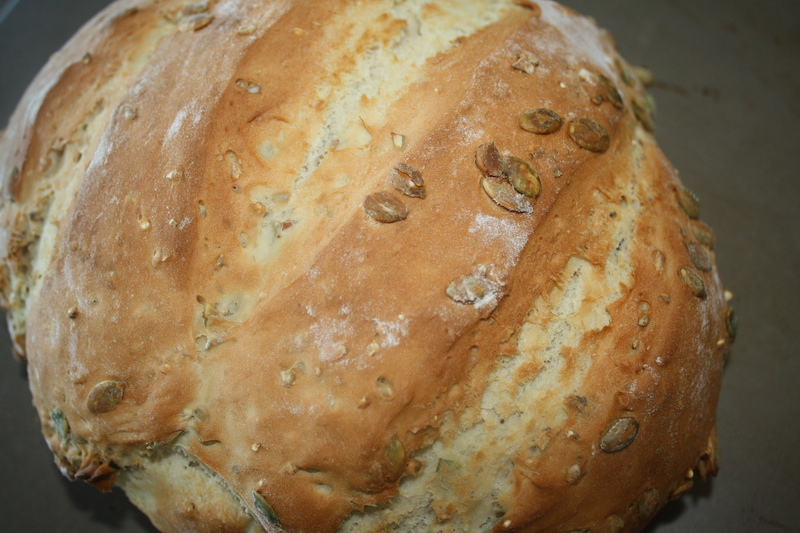 This recipe is the easiest bread recipe you’ll come across, with or without a food processor. Mix together and make a well in the centre. 3 tsp active dried yeast, sprinkled over the top of the water. Leave for 10 or so seconds, then give it a quick stir with a fork. 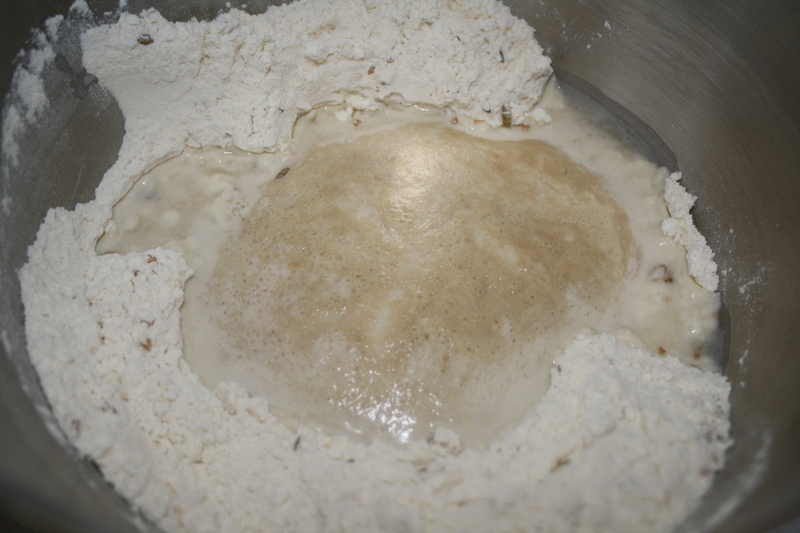 Leave for 10-15 minutes so that yeast begins to froth. 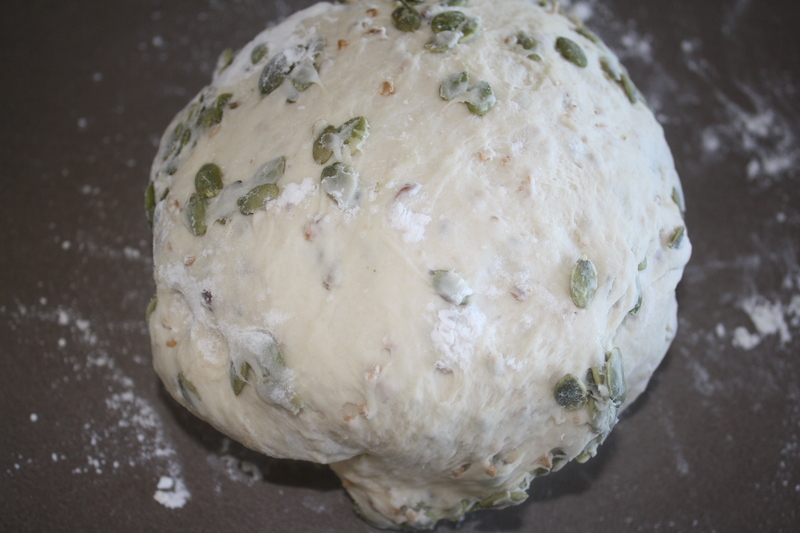 Pop the dough hook on to your mixer and let it do the work for you – it’ll mix in the liquid, then do the kneading. 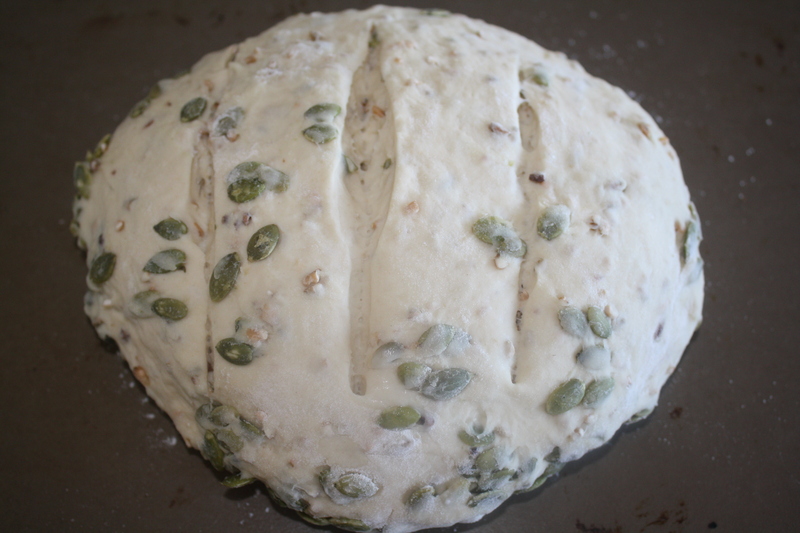 Quickly shape into a loaf- I normally opt for a boule shape. Put the dough on to a baking tray, sprinkled with flour or polenta, or a pizza tray. 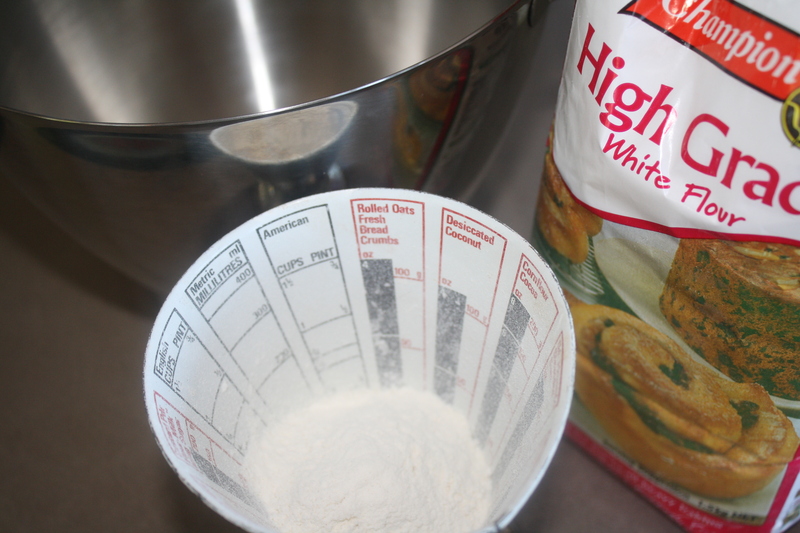 Put three shallow slices through the top. Put into a cold oven and turn to 220C. It will take 25-35 minutes to cook – it’s genius, the proving is done as the oven heats up. You can check the loaf is cooked by tapping the bottom of the bread – it sounds sort of hollow. Do this carefully as it will be hot. Take out of the oven and cool before cutting. 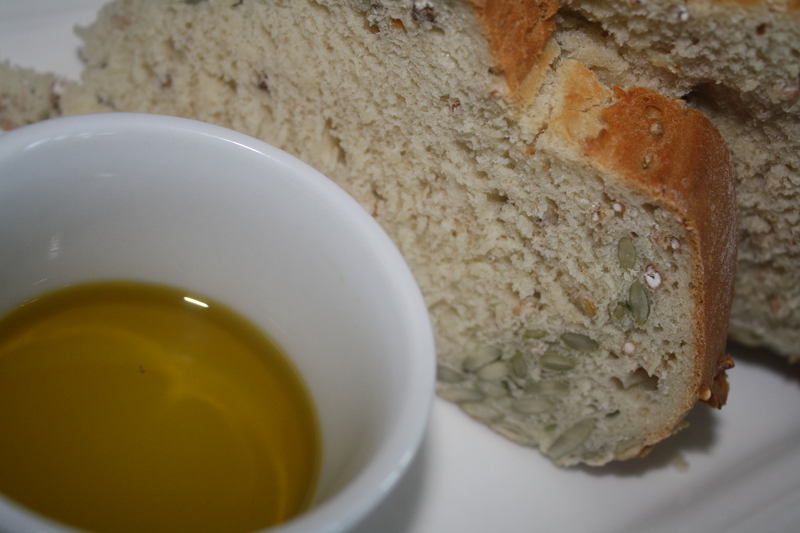 Enjoy with a freshly fried egg or dip in your favourite olive oil. If this is a slippery slope to slothdom, the taste makes it worth while. YUMMMMM. That bread looks divine! 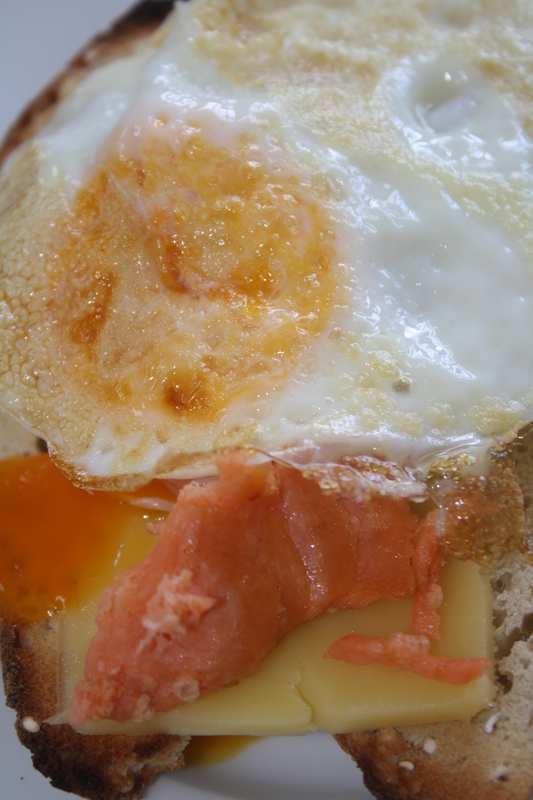 okay… think I’ll give the bread a go for lunches tomorrow… as for the fried egg, if you are having bacon with the egg (which you wouldn’t but your other two might) you can throw the bacon in first and then fry the egg with the bacon. Once the bacon is fried put it on top of the egg in the pan and it then sets the top… as for rubbery eggs, you can keep those to yourself… I hope you don’t inflict them on Master 2! !